German aviation giant extends cancellations, but 22 carriers continue flights; Transportation Ministry preparing for 'the day after'. German aviation company Lufthansa said Wednesday it was suspending services to Tel Aviv for another day over security concerns amid the escalating Gaza conflict, after halting flights for 36 hours. The German company, which also operates Germanwings, Austrian Airlines, Swiss and Brussels Airlines, said it was "evaluating the security situation in close consultation with the responsible authorities". It said it had cancelled a total of 20 scheduled flights to Tel Aviv on Thursday from Frankfurt, Munich, Cologne, Zurich, Vienna and Brussels. "At the moment there is no reliable new information that would justify a resumption of flight service," it said in a statement. The move came after Lufthansa Tuesday suspended services to the Israeli city for 36 hours "for the security of passengers and crew" amid the "unstable situation" at Ben Gurion International Airport. Several major carriers made the same decision after a rocket fired from Gaza struck a home in Yehud, which is near the Lod-based airport. Israeli Transportation Minister Yisrael Katz condemned the decisions to cancel flights as "surrendering to terrorism", and said that the threat to Ben Gurion airport was being exaggerated. Israeli carriers El Al, Arkia and Israir Airlines continue to operate as normal, the Transportation Ministry announced Wednesday, in order to provide an answer for passengers on other carriers. Twenty-two foreign airlines continue to fly into Israel as scheduled, including British Airways, Aeroflot and Ukrainian Airlines which operate several flights a day. Today, 209 flights will operate at Ben Gurion airport, with 132,000 arrivals and departures (not including flights arriving in Ovda airport near Eilat from noon today). The Ministry added that several foreign airlines seem set to resume regular flights into Israel. "Tourism in Israel has experienced similar crises in the past and has known how to deal with them," Tourism Ministry Director-General Amir Halevi stated. "We believe that the Israel tourism product is unique and attractive and we are already preparing for a broad marketing campaign that will launch 'the day after'. " Meanwhile, to provide for the thousands of tourists now stuck in Israel, the Ministry has opened a 24-hour hotline to ensure that any tourist whose flight was canceled is not left without accommodations. 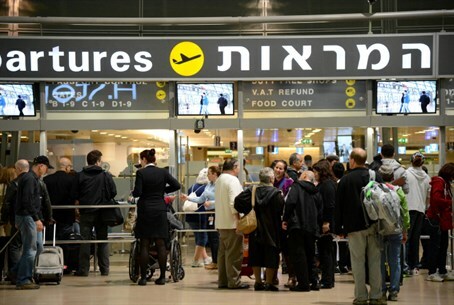 Tourists who experience difficulties as a result of the current situation are invited to contact the offices at Ben Gurion airport, which is manned 24 hours a day, at 03-975-4260.